Next to Denmark (69%) and Greece (56%), Sweden is one of the countries most inclined to grant credit terms, with a 2016 average of 56% of business-to-business (B2B) sales transacted on credit. This percentage is well above that of Western Europe (41%). 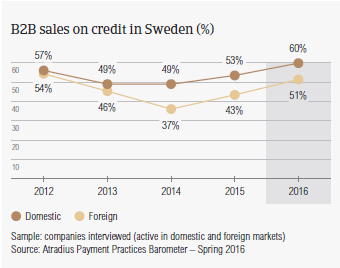 While the average percentage of sales made on credit increased in Sweden over the past year (2015 level: 48%), the average for Western Europe has remained unchanged. In line with the survey pattern (45% domestic and 38% foreign), Swedish respondents indicated a stronger preference for selling on credit to their domestic B2B customers (60%) than to their foreign customers (51%). With an average of 27%, respondents in Sweden experienced late payment of invoices less often than their peers in Western Europe (40%). 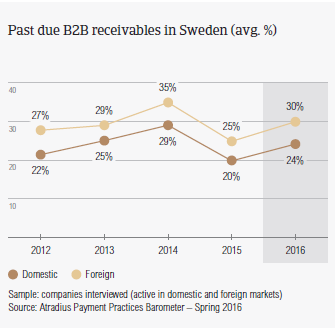 Overdue B2B invoices occurred more often with the foreign customers of our Swedish respondents (30%) than with their domestic customers (24%); Western Europe showed the opposite trend. The Days Sales Outstanding (DSO) figure posted by Swedish respondents, averages 34 days and is two days shorter than in 2015. In line with the DSO figure in Germany (33) and Denmark (32), this is notably below the survey average of 48 days. These findings indicate that respondents in Sweden are among the most efficient in collecting outstanding invoices. 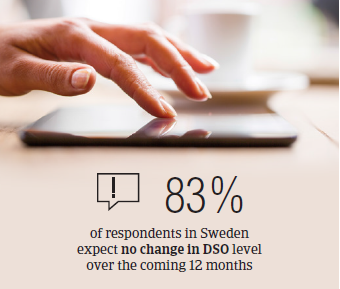 The majority of respondents in Sweden (83%) expect no change in DSO level over the coming 12 months. Sweden is a country largely focused on exports. Because of this, most of our Swedish respondents (27%) consider falling demand for their goods and services to be the main challenge to business profitability in 2016. 22% of respondents in Sweden expressed concerns about cost containment (average Western Europe: 23%). Sweden is one of the countries which puts great emphasis on swift payment. The average payment terms given by Swedish respondents to their B2B customers is 27 days from the invoice date, which is in line with that of the Netherlands and not markedly below the 31 days average for Western Europe. 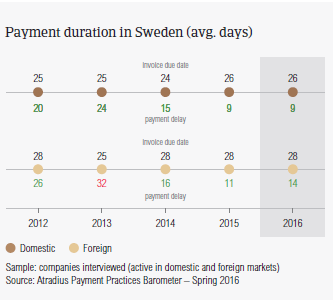 Compared to 2015, payment terms in Sweden have not changed, reflecting the country’s consistent payment culture. Like their peers in Western Europe, Swedish respondents reported that insufficient availability of funds is the primary reason for late payment from B2B customers. 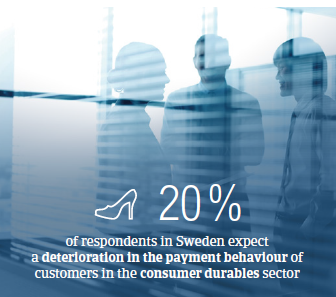 52.5% of respondents in Sweden cited this reason in regards to domestic payment. At the same time, foreign invoices paid late because of liquidity issues are consistent with 2015 levels (44%). The second key payment delay factor in 2016 was the buyer using outstanding invoices to obtain financial advantages. In contrast to respondents in Western Europe, who cited this reason equally as often in respect to both domestic and foreign late payment (around 25%), more Swedish respondents reported this delay factor in respect to foreign late payment (32%) than to domestic (25%). About 25% of Swedish respondents believe that payment by foreign customers was delayed because of external factors such as inefficiencies of the banking system. 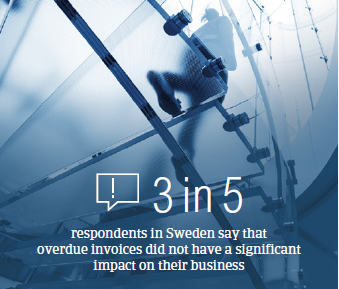 Most Swedish respondents (61%) indicated that over the past 12 months, overdue invoices did not have a significant impact on their business. However, 16% indicated that overdue invoices led them to postpone their payments to suppliers and 13% that they caused a default in their own payments. To better manage their accounts receivables, around 26% of Swedish respondents said they will check their buyers’ creditworthiness and 22% will monitor their customers’ credit risk more frequently. 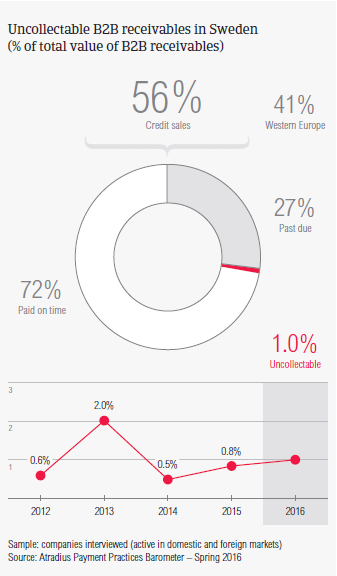 Swedish respondents reported that 1.0% of the value of their B2B receivables was uncollectable; this percentage is in line with the 1.3% average for Western Europe. Consistent with the survey pattern, uncollectable domestic receivables were written off almost as often as foreign ones. Like in 2015, uncollectable domestic B2B receivables are most often reported on sales to the construction, and consumer durables sectors. 62% of respondents in Sweden compared to 59% in Western Europe said that B2B receivables were mainly uncollectable because the customer went bankrupt or out of business. For 21% of Swedish respondents, slightly fewer than in Western Europe (29%), B2B receivables were uncollectable because of the failure of collection attempts. For more insights into the B2B receivables collections practices in Sweden, please see the Global Collections Review by Atradius Collections (free download after registration), available from October 2016 on atradiuscollections.com. Survey respondents in Sweden reported granting trade credit terms mainly to B2B customers in the construction, consumer durables, business services and services sectors. B2B customers in the above mentioned sectors are extended average payment terms consistent with the country average (27 days). Despite this, B2B customers in the consumer durables sector generate the highest level of overdue payments. Over the coming 12 months, around 70% of respondents in Sweden do not expect a significant deterioration in the payment behaviour of their B2B customers. At the same time, 20% expect deterioration in the payment behaviour of customers in the consumer durables sector.